The industries first and most superior pedicure products on the market today. 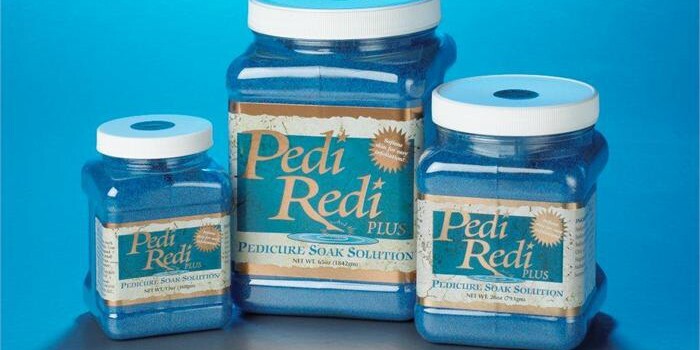 Pedi-Redi Plus is the best soaking product you can use in your pedicure spa. Seasonal fragrances and customize them with colors. Earn additional income by offering your own private label. Pedi Redi Plus superior formulations contains only the highest quality ingredients and is economical to use. The special formulated powder which combines sea salt, epsom salt along with other key ingredients to clean the feet and soften calluses and cuticles for easy exfoliation. Pedi Redi Plus contains a combination of essential and fragrance oils along with our famous vivid water colors are sure to please your clients. This is non-foaming and completely safe to use in all pedicure equipment, while containing a cleaning agent to improve the ease and speed of cleanup.